ILUKA RESOURCES is a major participant in the global mineral sands sector and is involved in the exploration, project management, operations and marketing of zircon and titanium based products. With a corporate support centre in Perth, we also have activities in regional Western Australia, Victoria, South Australia, USA and Sierra Leone. Applications are invited from experienced and passionate professionals for the permanent position of Community Relations Officer. Based in Ceduna and at the Jacinth Ambrosia Mine, the position comprises a 5/2 and 4/3 roster (4 days on the mine site and 5 days in Ceduna per fortnight). Travel by road and air to and from site, to remote communities and Adelaide are requirements of this role. Reporting to the Environment, Rehabilitation and Community Relations Superintendent, this role has a strong focus on Aboriginal relations and local community engagement. The position is critical to Iluka’s social license to operate in South Australia and the Eucla Basin. • Implementation of Iluka’s Native Title commitments in the Eucla Basin, including Aboriginal recruitment and employment pathways and business development. • Develop and implement community relations programs and provide support to the SA Projects and Exploration teams. • Form close relationships with key stakeholders, community leaders and commentators, listen to and capture viewpoints and concerns. 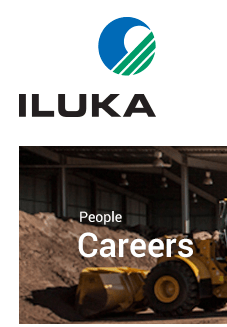 You will have a working knowledge of community consultation techniques and have the skills to be an effective ambassador for Iluka in the community. The ability to plan and implement the Jacinth Ambrosia Social Engagement Plan is required. Working in a dynamic project team environment, you will need to be able to identify and focus on high priority tasks, often work under pressure, seek and drive improvement opportunities and meet important project milestones. • Knowledge of Aboriginal heritage and native title issues in South Australia and demonstrated experience working with Aboriginal people and communities. • Experience in preparation of communication materials for a range of audiences. • Good word processing and computer skills. For further information about the role, or to discuss your suitability, please contact Joanne Lee Environment, Rehabilitation and Community Relations Superintendent (08) 8670 2813. All queries and applications will be handled in strict confidence. We reserve the right to remove or modify any listing without notice. ← Have you collected your Membership Card?